Cook potatoes until tender; drain. Mash potato until smooth and stir in the milk and half the Philly*. Keep warm. Heat butter in a pan and sauté the onion and carrot until tender. Stir in remaining Philly*, mustards and the combined extra milk and cornflour. Heat, stirring, until smooth. Add the fish, peas and parsley, bring to boil then remove from heat. 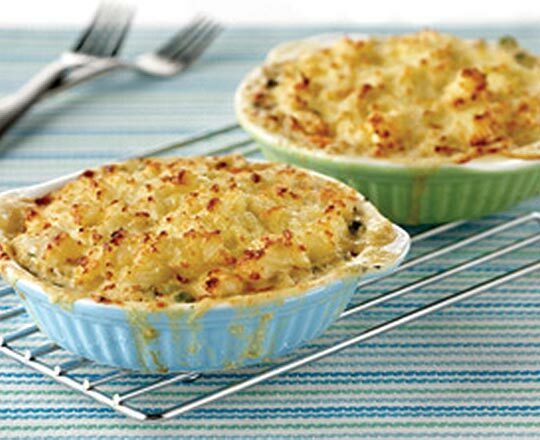 Spoon mixture into 4 individual baking dishes or one larger one, then top with mashed potato. Bake at 180°C for 15 minutes for the individual or 25 minutes for the larger, until heated through and golden on top. Serve immediately.